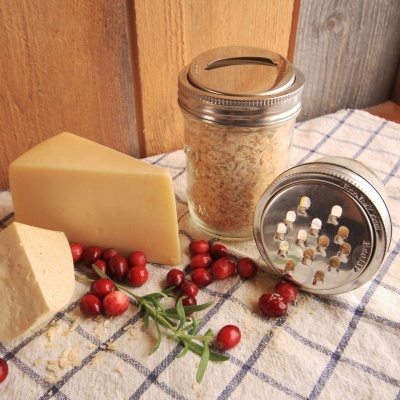 EcoJarz stainless steel graters that fit wide-mouth mason jars. Choose either one large-tooth slicer lid or one medium-tooth grater lid, or the set of two. Jar not included. 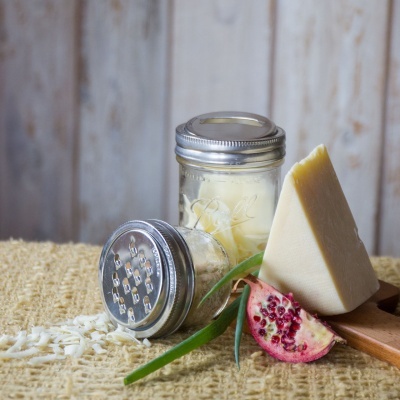 Use with cheese or veggies and grate on the go! 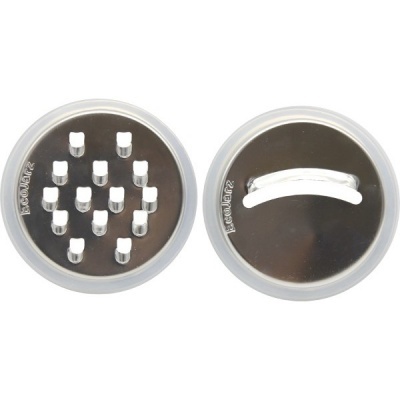 EcoJarz stainless steel graters that fit wide-mouth mason jars. Choose either one large-tooth slicer lid or one medium-tooth grater lid, or the set of two. Attach either one to the top of a canning jar with a jar band and grate cheese or veggies directly into your jar. Perfect for jar enthusiasts, simple living, and for use on-the-go. Made of 18-8 food grade 304 stainless steel and FDA-approved silicone. A “jar band” is the metal ring which threads onto a glass jar and is necessary to attach an Ecojarz Grater. It works just like a canning jar lid in that regard. If you already have jar bands you are good to go, otherwise, you can add one to your order.